The new type 22B4-60P gearmotors combine our high-performance 22B brushless DC motor with the all-new type -60P planetary (60mm) gearhead. The gearmotors’ relatively small diameter, wide speed range, and high torque-density make them an ideal drive solution for industrial automation, pumps, packaging equipment and many other industrial applications. • Encoder-compatible with new optional screw-in encoder shaft kit. (Standard/ stock models supplied with factory-installed cover over shaft opening). 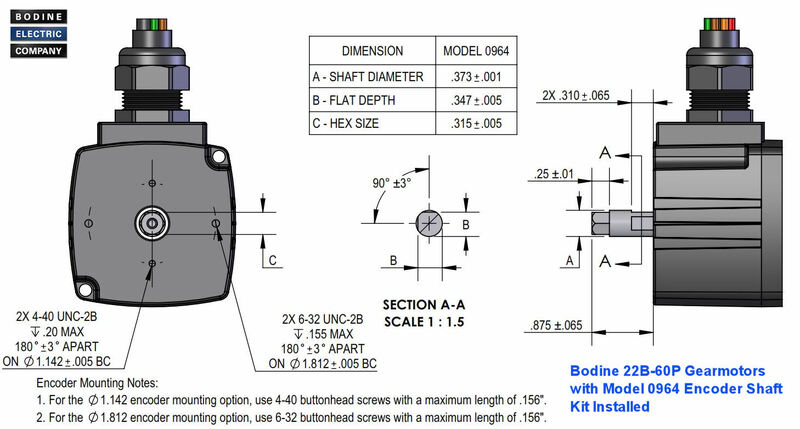 To view detailed technical specifications or to download a CAD file, click here. Copyright Bodine Electric Company © 07/2018. All rights reserved.